The Optio430 is a sleek, stylish, compact camera which packs quite a punch. 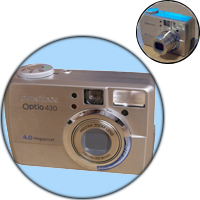 At 4MP it can produce images of sufficient resolution to be printed as A4 and above. The brushed-aluminium design is clean an uncluttered, with just a smattering of buttons and the build quality is extremely good. It is also physically small enough to fit in your pocket quite easily. Operation is very easy, and it really is a point and shoot camera, and if this is what you want, then you can't really go wrong. The downside of this is that if you want to use the more advanced features, then you have to resort to navigating menus using the four-way navipad. Whilst the camera does offer a manual mode, this is much harder to use than either shutter- or aperture-priority, which are not present. That said, you can still use manual mode to do everything that SP and AP can do. There is also an absence of an exposure compensation setting, but again that can be achieved using manual mode. The TFT display, whilst quite small (due to the size of the camera), is clear and bright. All the current settings are reported via the display, as there simply isn't room for the separate LCD display often found on larger cameras. This means that the screen must be turned on more often to find out what is going on, but provided that you don't have it on all the time, the custom lithium polymer battery lasts quite a long time. It does take a few hours to charge though, so a worthwhile investment is a second battery. Image quality is excellant and prints are indistinguishable from those produced from film. Even when quite drastically cropped, there are still enough pixels to create a decent sized print. At the highest quality setting images are still fairly well compressed, with an typical image being 2MB is size. The supplied 16MB card is pathetic, and you really need a 64MB card to be of any use. One minor failing (which is easily remedied) is that the auto-focus system isn't terribly good at landscapes. You will find that the far distance is just that little bit out of focus if you let the camera decide what to focus on. The solution is simple, just turn the mode dial to landscape mode to tell the camera what you are photographing. Another issue, again minor, is that the macro mode is not terribly good in low light. This is due again to the size of the camera and thus the size of the lens. You simply can't get enough light into the camera to avoid camera shake. Solution, use a tripod or light the subject better. There aren't really many optional extras for compact cameras like this one. There is no hotshoe for an external flash and there is no way of attaching additional lenses and teleconverters, but you can use filters by using a filter holder which attaches to the tripod socket. Apart from an AC adapter, the only other accessory is a Remote Control unit. This is an infra-red device which allows you to remotely operate both the shutter and the zoom. This is a good little camera and produces good sharp images. If you are looking for a compact digital, the this is seriously worth considering, though at the time of writing, this model has been superceded by the 430 GS and now the 450 (which has a 5x optical zoom). Pentax have also introduced the 5MP Optio 550, but this is obviously much more expensive.